NeoCon’s 50th show in Chicago offered unparalleled access to what’s new and what’s next when it comes to emerging workplace products. During this year’s show, the 7th floor of the Merchandise Mart was no exception with approximately 300 exhibits leading the way. There was so much to see, we enlisted our friends at CallisonRTKL to help us curate a list of solutions that caught our attention. We hope you find inspiration in what we found! The Attenzia immediately caught our attention! One of the newest ergonomic desk accessory in the More Space System by Novus, Attenzia is easy on the eyes while being certain to boost attention. Novus Attenzia LED Lighting is designed to provide the best quality of light for your personal workspace. The recessed LEDs produces a vibrant, white light that reduces eye strain and improves focus. It features adjustable brightness with memory, pivoting joints for easy positioning, and a thin rotating lamp that allows you to focus the light right where you need it. Specializing in fixed seating, Borgo displays their well known Flex chair, which uses the most durable plastic – strong enough to jump on without a dent or mark. With a sleek handle for moving that acts as a purse hook, the stackable Mork & Mindy chairs were also introduced. Stadium seating, with auto retractable tables – this is the piece I found most interesting. There is a video I took to demonstrate this. A flush glazing system with no vertical profiles even at the corners, LineaCube has a quality that is completely transparent. All glass has also been tested with 28-52 stc ratings with solid walls having 68 (typ 48) stc. 13’ high. With its ability to support a standalone ceiling, the single glazed system is also higher than most on the market. Interesting fact? Maars was also just acquired by Herman Miller. As the pioneers of commercial ePaper technology, a color changing plastic film material also used on Kindle, E Ink has helped define the eReader market. Now, E Ink is helping redefine the architecture and design markets by providing application of this technology to virtually anything from floor, walls, windows, ceilings, or exteriors. It’s also versatile. Through its weather proofing film for outdoor use, application can be anywhere and any pattern can be cut out of these ePapers. E Ink is also a low power installation that can function through batteries, plug in or solar power. … a low power installation that can function through batteries, plug in , or solar power. Featuring the largest E Ink technology is the “Dazzle”, a monumental public artwork, at the San Diego National Airport. By having a display that uses transmitters hidden in the palm trees across the street, it can transmit a dynamic animation using solar panels, so no need for plugs or batteries. The highly adaptable acoustical paneling system, EzoBord, were the first, in 2010, to start working with PET felt. Their highly durable and strong line of products have the ability to create custom printing on any of their felt products. …have the ability to create custom printing on any of their felt products. Their product, Grid Canopy, is comprised of felt baffles that can link to any T-grid system. Their Acoustic Net system can be customized to any size or undulation, while Peri is great for an agile workspace that needs to be reconfigurable. In an effort to create different structures, EzoBords’ product pieces can be continuously added or removed them. The full launch is in September. As a company focusing on the art and acoustical aesthetic in any space, Luceplan debuted their newest collection at NeoCon – Trypta – a system of suspension lamps consisting of a cylindrical aluminum body equipped with two dimmable LED sources. All acoustical lightings have embedded panels and fixtures that can be made in different fabrics. NRC ratings can run before and after installation and can adapt to a space’s NRC needs. 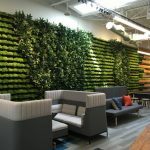 Creating a sustainable building block technology that allows for the reconfiguration of any space, the Clickwall System customizes any wall through magnetic wall coverings, panels, and cling wraps allowing for easy re-use and re-design. A kit of demountable and movable pieces, their Clickwall system is about $10/sq ft which competes with drywall construction. One of the busiest booths was Configura who is known for their single software solution for space planning and product ordering, CET Designer 9.0. With their newest extensions, users drag and drop components into 2D and 3D virtual environments; behind the scenes, the software tracks components, calculates pricing and prevents user errors [which the c-suite will like]. Additionally users can create and generate layouts, quotes, photorealistic renderings, fly-thru videos, 360-degree panoramic movies, installation drawings, reconfigurations and bills of materials. The latest CET Designer Extensions let designers use virtual and augmented reality technologies to provide powerful visualization experiences for their clients. We even caught Johan Lyreborn, Configura’s CEO, using Praxik’s newest CET Designer Extension Instant AR! Nicely timed to coincide with NeoCon’s 50th celebration, LOGICDATA was exhibiting their SMARTneo solutions. If you are tasked with creating a human centric workplace, the electronic and mechanical systems plus the embedded software for furniture can help. Inspired by nature, Snowsound acoustic panel technology mimics the sound absorbing properties of freshly fallen snow by reducing unwanted reverberation. With influences from the fashion industry the si sboccia in both the wall mount and suspended ceiling versions stood out. These echo canceling products consist of velvet polyester fabric with wood conglomerates at the central core. The workplace press community owes Bretford an extra ‘thank you’ as their products lined the press room and providing a charging haven during this busy show! Their Juice Mobile Power offering allows any space to turn into a powerful mobile digital hub all from one outlet. Plus it allows for endless flexibility as shown in this short video here. See you next year on the 7th floor*! If you are interested in helping us review new products for possible inclusion in next year’s 7th floor finds, contact emma.weckerling@workdesign.com today!